Home / About Clots / Blood Clots in Children Resources / What are “DVT”, “PE”, and “VTE”… and how common are they in children? 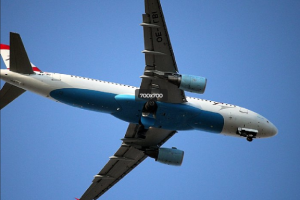 Deep vein thrombosis or DVT: A blood clot in your deep veins. Pulmonary embolism or PE: A blood clot in your lungs. Venous thromboembolism or VTE: The term members of your health care team use to refer to both DVT and PE together. Pediatric hematologist: A type of doctor specially trained to treat children’s blood disorders. Arterial Thromboembolism: Blood clots in the arteries that move oxygen-rich blood from the heart to the rest of the body. “We:” We use the word “we” to refer to all of the members of your health care team, doctors of all kinds, nurses, and others. DVT can happen in the veins that carry blood away from the arms or legs. DVT can also occur in other veins. These include the veins that carry blood away from the brain and neck, the liver, and kidneys. Blood clots can happen at any age. Although blood clots happen more commonly in adults, they can also happen in children. About 1 in 10,000 children get blood clots, including as many as 1 child in 200 children in hospitals. 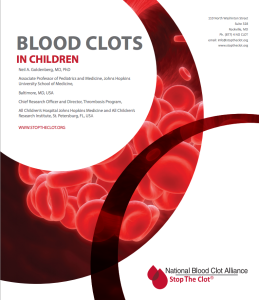 We present an overview of blood clots for children, their families, and their health care providers. 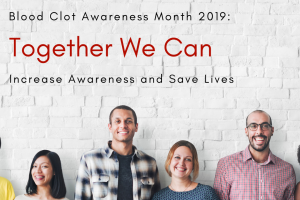 We explain the causes, signs and symptoms, diagnosis, treatment, and long-term effects of blood clots. We explain that the best treatment for children with blood clots is a team approach. This team should include a pediatric hematologist with experience in VTE (blood clots). Some of this information we discuss here also applies to arterial thromboembolism. However, this in this overview, we focus on blood clots in the veins.